Overall factors: The fiber in these bars come from a combination of soluble corn fiber, polydextrose, and dextrin which I estimate 10% of as net carbs. To keep things relatively simple I'm going to add 1g of net carbs for each product that has close to 10g of fiber. Some of these snacks also contain Maltitol which is a sugar alcohol with a glycemic index of 36. (more than half the GI of table sugar) I'm counting 50% of the Maltitol in these treats as net carbs for simplicity, which is low-balling since it's closer to about 67%. These snacks are also low nutritional density and easy to overeat. 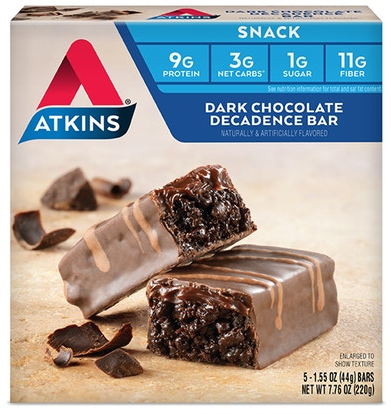 These Atkins Snacks fit in pretty well with the rest of the Atkins brand products, they tend to use sources of fiber and sugar alcohols that raise blood sugar, and there really isn't any excuse these days with how many zero glycemic options are available these days. 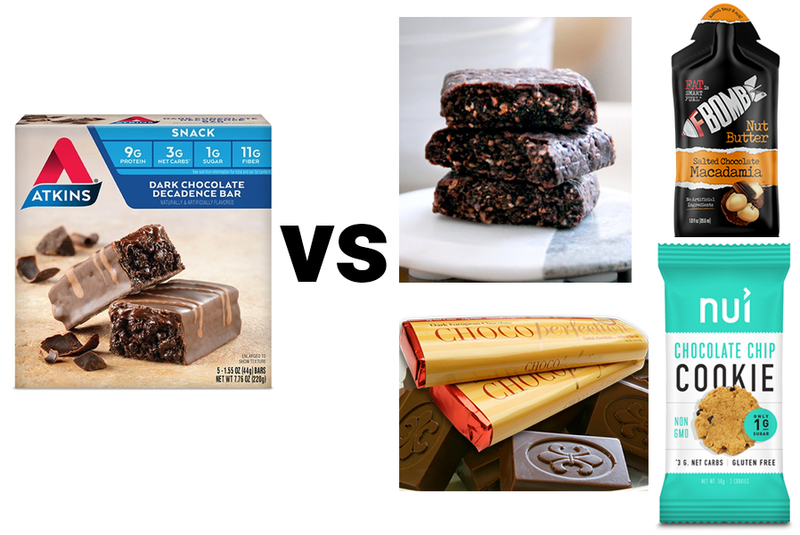 Some of these bars may seem keto friendly on the surface, but when we compare them to real keto friendly snacks and treats, the cracks start to show. As you can see, when comparing Atkins Snack bars to the best keto-friendly treats out there by net carbs per 100 calories, which is the most consistent indicator of keto friendliness, there is no contest. So in conclusion I recommend going with more keto friendly sweet treats like ChocoPerfection, Nui cookies, Keto Bars, and F-Bomb pouches. My personal favorite is ChocoPerfection, it gets an A- keto friendly grade and an A+ in taste from me.